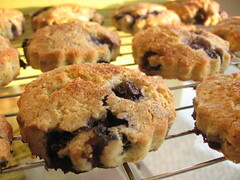 Blueberry Cream Scones - Do You Know The Muffin Man? Notes: I used frozen blueberries to make these scones (more leftover ingredients: 35% cream). As I was stirring this gluten-free dough together, I was thinking about how you don't have to worry about overmixing (which causes toughness) since there's no gluten to be formed. I ended up with 15 2½" scones; they could have been made thicker I guess. Very tender and buttery, but not sweet enough on its own.